About Crown Meadow An “Old School” ground is how you could describe Crown Meadow, with one large main stand, slightly set back from the edge of the pitch and then a barrier around the rest of the ground. 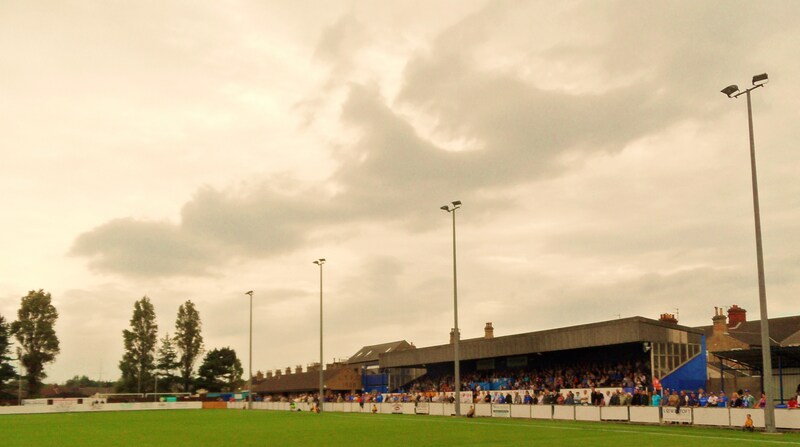 There is also a small covered terrace in the south east corner of the ground. The south end of the ground has one of the narrowest walkways known to man due to the proximity of the houses. There is a decent bar and two catering units so food and drink are not an issue. How to get to Crown Meadow If you are coming by car then undoubtably you are coming from the south or west. Follow the A12 all the way into the town centre, crossing over the water inlet and then following the round round past the station into Denmark Road. At the main junction turn right (still the A12) into Katwijk Way. At the next roundabout take the 1st left into Raglan Street and then turn right. Follow this road until the junction with Love Road and then turn left. The ground is a 100 yards down this road. There is plenty of street parking around the ground. If you are coming by train then Lowestoft is the end of the line for most services either from Norwich or Ipswich. Come out of the station and turn left. Cross the road into Katwijk Way and then follow instructions as per driving. It should take about 5 minutes. Admission to Crown Meadow Admission this season is £10 for Adults, £6 for Concessions and a whopping £4 for Under 16s. Programmes are available inside the ground at £2. Our last visit – August 2011 Finally the wait was over. 9am, Saturday morning, Liverpool Street station and we were boarding an old style InterCity 125, especially laid on for the Lewes Lunatic Fringe to take us north east to the Suffolk seaside. Welcome to the 2011/12 football season. Now some of you may think we are a couple of weeks too late with this post, but remember we now live in the Isthmian world and thus any reasonable logic has to be suspended. Kicking off their leagues two weeks after most divisions is hardly a sensible idea when we will almost certainly have “the worst winter ever” and most clubs will then end up playing 8 games a week to catch up. But we long gave up trying to understand how exactly they are helping clubs. When the fixtures eventually came out (some weeks after the rest of the divisions), we all groaned at seeing our first opponents. No disrespect to Lowestoft Town, but a three and a half hour train journey (add an hour and a half for those from Brighton) was not on the agenda for day one. The bookies had made Lewes favourites for the title, and The Trawler Boys second favourites, so this was sure to be Sky Sports game of the day? No? Oh well it seems like I am going to have to tell you all about it then. The main worry for the travelling fans (aka Dave, Deaks, Terry and me) was whether Lewes actually had a squad of more than a dozen players. Pre-season had been a mixed bag. A couple of decent wins, a couple of disappointing defeats. But that was irrelevant. It was time for the main event. We arrived in Lowestoft via Naaarwich and numerous Alan Partridge-inspired gags, and immediately headed for the Lowestoft Beer Festival. Such an event happens but once a year and we were in luck that our visit coincided with the event. It was being held at the Triangle pub which didn’t strike us as the typical festival venue. No tents pitched outside, no Viz-inspired Real Ale Wankers and nobody actually there at all. Everything pointed to a damp squib. But we were wrong and a few pints of Sheepshaggers Gold, Radgie Gadgie and Seven Giraffes soon saw us right, although the “attractive beer garden” turned out to be a bench amongst the wasp infested bins. After we had won the battle by killing a good half a dozen of the buggers we admitted defeat and headed inside just in time for the rest of the travelling Rooks to arrive on the coach. With over 40 fans having made the journey it was officially the biggest away day since Eastbourne Borough at Christmas 2008. Everyone was in fine voice after enjoying some cheap, decent beers and the party continued in Crown Meadow. An “Old School” ground if there ever was one with a decent size club house complete with a disco ball – perhaps a good omen for a post match party? Optimism was at Defcon 3. Lowestoft Town 3 Lewes 1 – Crown Meadow – Saturday 20th August 2011 After six minutes there was a stunned silence around the ground. Neither team had actually had a shot on goal but there, in the back of the Lowestoft net, sat the ball. Nestling nicely in the corner. Lewes were one nil up. All of our pre-season nerves had been washed away and most of us had missed it. Apparently Lowestoft’s captain, Greg Cane had misplaced a backpass, lobbing the keeper when under no pressure at all. Whilst not in the Lee Dixon/David Seaman class from 20 years (gulp!) ago, it wasn’t a bad effort. We all pinched ourselves. In truth we had come in hope of a draw and despite an offer of a pint of Stones and a cheeseburger if he ended the game there and then, the referee stuck to the rules that the game should last the full ninety minutes. Hope soared when a Sterling cross was met by Dwayne Lee and the ball hit the ball. For a few more minutes we dared to believe that we be singing “Jingle Bells” all the way home. But it was not to be. Just before the half hour mark when Andrew Cave-Brown smashed home a knock down in the penalty area. In truth it was deserved, but as away fans we would never admit to that. However, just a few minutes later we get another boost. Our top scorer, aka Lowestoft’s own captain Crane, was given a straight red for something he said to the referee. In times where you often hear players aiming abuse at the officials what on earth can you say to a referee these days that would result in a straight red? It wasn’t even as if he had been involved in any controversial incidents – in fact Mr Magill had been inconspicuous. Half time came, with Steve King, serving a touchline ban from his time at Farnborough waiting in the dressing room to give the team a pep talk. Touchline bans at this level are absolutely pointless as with 90% of the 762 fans in attendance on one side of the pitch all King had to do was stand behind the goal and shout his instructions to the players. Still another useless decision by the Non League authorities. Whatever King said at half time to the team obviously went in one ear and out the other because before we had even managed to leave the bar Lowestoft were ahead with Lubo Guentchev scored from close range. It was tempting to turn back round and go inside but when there is time there is hope. The sunny start to the day had been replaced by a typical English summer drizzle. Surely with a slippery surface it would be a great opportunity to get the tricky Ciardini running down the line? Our spirits perked up when former Farnborough front man Paul Booth came on, but he never got the service that normally makes him so dangerous. The fourth official stuck up five minutes, but it was too much too late for us as with a 5.08 train to Ipswich to catch we had to go. And, as soon as we had stepped foot outside the gates two became three as Chris Henderson scored from close range. All three goals had come from balls across the area and finished at close range. To coin a phrase from Oscar Wilde, to concede one like that is unfortunate, to concede two is carelessness but three? Well that is just crap defending. We had plenty of time on the way home to contemplate the team, the performance, the season ahead and what we had just seen. Or we could just have a few Adnams and plan our next away day thanks to Terry’s Ryman League Handbook. 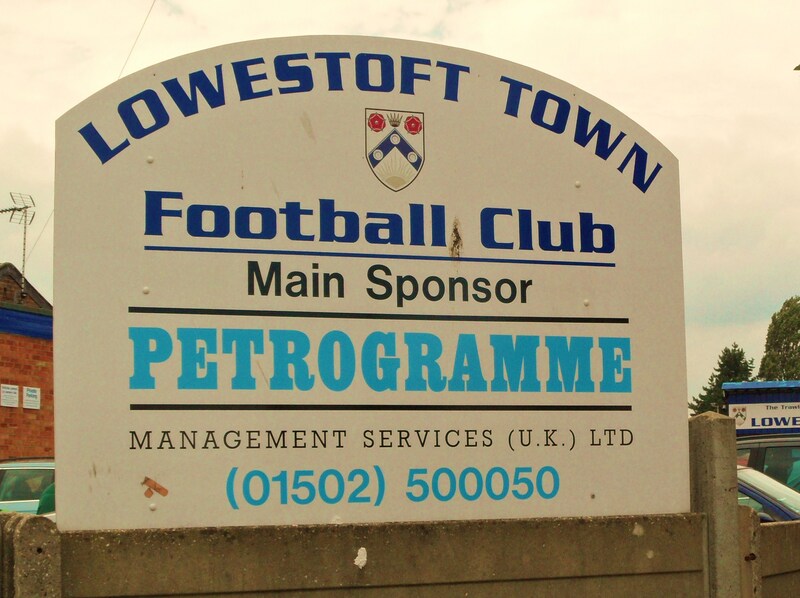 Lowestoft had lived up to their billing, Lewes had fallen a long way short. The first and probably last InterCityLewesFirm trip had come to an end. More pictures from the bad day at the office can be found here.